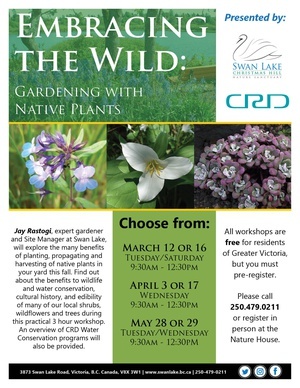 Jay Rastogi, expert gardener and Site Manager at Swan Lake, will explore the many benefits of planting, propagating and harvesting of native plants in your yard this fall. Find out about the benefits to wildlife and water conservation, cultural history, and edibility of many of our local shrubs, wildflowers and trees during this practical 3 hour workshop. An overview of CRD Water Conservation programs will also be provided. All workshops are free for residents of Greater Victoria, but you must pre-register. Please call 250.479.0211 or register in person at the Nature House. Swan Lake Christmas Hill Nature Sanctuary is a wild oasis in the heart of the urban landscape & includes two distinct ecosystems: the marshland of Swan Lake & the Garry oak meadow on Christmas Hill. We also offer a variety of engaging programs! FREE - 10th Family Sport and Recreation Festival! Outreach Programs: Have the Victoria Bug Zoo come to you!